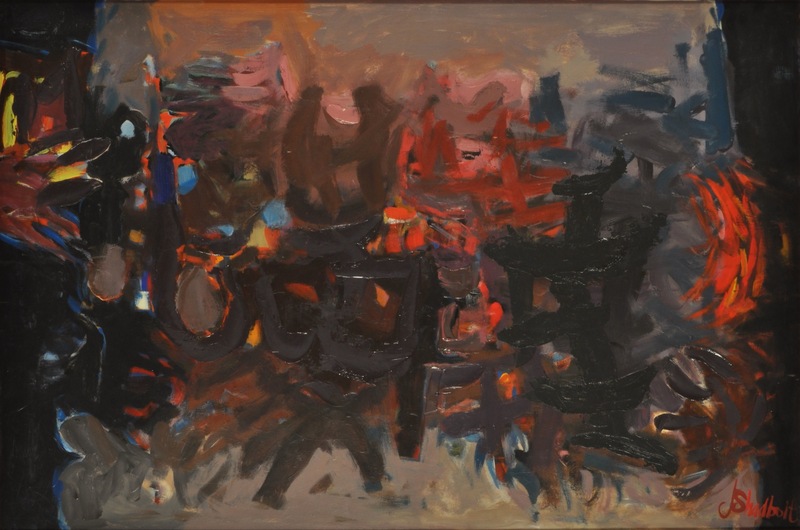 British-born artist Jack Shadbolt, who settled in British Columbia as a young child, came to abstraction through his experiences overseas during the Second World War. The skeletons of buildings ruined by bombs gave him a compelling visual of a structure laid bare. Art, he reasoned, could take forms apart, but also “reassemble” them.1 To do so, the artist needed to wrest free from the artificial strictures imposed by realism. After the war, Shadbolt began in earnest to explore the possibilities of abstraction—first in New York, where he encountered the work of Abstract Expressionist artists, and then back in Vancouver, where he studied alternative means of expression, including African tribal iconography, Surrealism, and the art of Picasso and Arshile Gorky. Over his prolific career, Shadbolt ventured into varying degrees of abstraction, sometimes combining non-objective forms with images from nature such as butterflies and plants. In Dark Garden #2, Shadbolt employs a title that anchors his work to nature and encourages readings of his swirling forms as flowers, leaves and stems. Without this title, the dark brushstrokes that score the painting may evoke Japanese calligraphy. Characteristic of Shadbolt, the painting hovers between representation and abstraction, hinting at other, perhaps symbolic meanings that will never be resolved. Like Arthur Lismer and Jock Macdonald, Shadbolt also distinguished himself as a teacher. From 1938 to 1966, he taught drawing and painting at the Vancouver School of Art, inspiring generations of students and confirming his lasting influence on 20th-century Canadian art. 1. Joan Murray, Canadian Art in the Twentieth Century (Toronto: Dundurn, 1999), 108.